To celebrate the final passing of the high pressure and howling winds, scores of pilots took to the skies and flew between showers over the last four days at Kahana and Makapuu. I was shuttling the kids around on all four days, but somehow I still managed to join the Kahana crew for some great flights on all four days. Here is my brief account of each day, along with lots of fun pictures (courtesy of Jim, Nick, Scrappy and Russell). 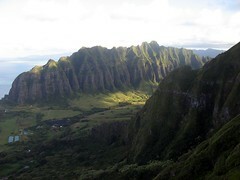 On Thursday I flew early with Don, and as a wide band of squalls marched into the bay, I fled downrange to Hauula while Don landed at Kahana to grab his truck and retrieve me. Thanks, Don! I picked the kids up from school and on the way home we stopped by to see One-eye, Christine, and Portland Paul flying the late shift. On Friday, I spent most of the day at Amelia's May Day celebration, but after bringing the kids home from school I dropped them off with Dorothy's parents and scrambled out to join the north ridge crew at Kahana: McStalker, One-eye, Christine, Steve, Bill. I had to work very hard to get up and get high enough in the lightest of north conditions, but I was rewarded with a lucky bay crossing to Kaaawa. 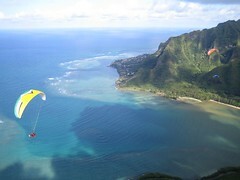 I heard Maui Paul flew with the guys out at Makapuu, and Dave demoed the M2 with a flight out and back to Lanikai. Jimmy entertained the guys out there with a demonstration of speed-riding from Cactus in a 10 square meter Ozone Bullet. 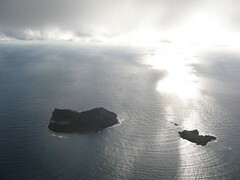 On Saturday, Scrappy started the flying day early with a sweet sunrise flight at Makapuu. I spent the morning ice skating with the kids at a birthday party for Amelia's classmate, and after that Amelia and I hiked up to watch Peter, Portland Paul and One-eye launch the north ridge at Kahana. We saw Peter make it across the bay to Kaaawa in the demo M2 from Chris. Nice! I threw Amelia onto my back for a quick piggyback ride down to the trailhead where Dorothy picked her up, and I ran back up with my wing for a flight. I tried several times to follow Peter across the bay, but the window of opportunity seemed to be firmly closed. Great flight Peter! Over a dozen pilots flew over the course of the day. Nick took some great pictures and video. We met Berendt, a local pilot who learned to fly in the old days (1990) but hasn't flown in quite a while. 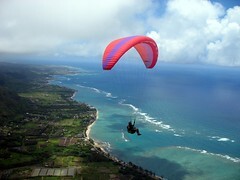 He enjoyed a very nice first flight at Kahana. Pete's new student Nicky also enjoyed her first tandem flight there. Bob treated Peter's friend Kat to a brief tandem flight as well. Nightshift closed down the day flying just ahead of a hurricane-sized squall - we named it Amelia. Sunday started with squalls up and down the windward coast. You didn't fly Sunday morning if you weren't dodging squalls. Over twenty pilots flew at Kahana over the course of the day (and I'm told at least five flew at Makapuu too). Rich got his first high flight (on his second attempt - the first was foiled by a rubber tree). Thom was there for a while and kited Don's old relic at the LZ. 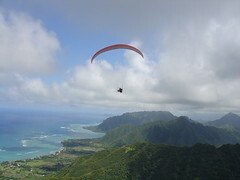 Reaper showed up and flew a tandem with his new student Diamond Head Doug. It was nice to see Eric and Cliff out there too! I heard Skydive Chris came out to fly but somehow I totally missed him - maybe he showed up for quickie while we were downrange: Russell was kind enough to lead me and Don to Pounders. But once again Russell turned back and landed just short on the Hauula side of the rock -- he must have unpaid parking tickets in Laie or something. I also see that Dave posted a cryptic comment about excitement at Makapuu on Sunday - I'm always interested to hear another exciting story from Dave - let's hear the story! I loved the Mantra M-2 . . . it is an X-C Machine!!! 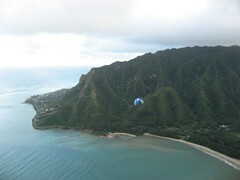 It made the flight across the bay; to Kualoa and back in good conditions seem VERY simple. However, so as not to be outdone, my MANTRA (first generation) insisted that I cross the bay in POOR conditions, after drying out in flight after getting dumped on by an unfriendly squall. That was, also, a fun flight. Mantra & M-2 = X-C Machine!! Great roundup, thanks Alex. I landed the "other" side of the rock because IKE observed that we were all coming in at the same time and it would be good to spread the traffic out a bit. 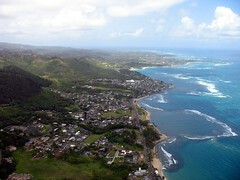 He suggested I land on the Hauula side because I've landed there before, which seemed sensible to me. One of these days I MUST get up over Sacred Falls. Perhaps you can lead Cliff and I next time?!? He's really keen to head downrange now. Anyway, thank you and thanks IKE for the fun XC. And many thanks to Big Bob for the pickup afterwards.